Please note this article dates from 2008. Since then, we've developed various answers to the questions raised in this article. Food is such a basic asset and requirement to our society, that it is often overlooked. Our ways of producing the majority of our food has in many ways changed little over time, while virtually everything else, the way we live, work and interact, has changed dramatically. We have a choice in how we produce food, and while the world is changing, it is important to investigate alternatives to our traditional way of food production. One reason for doing so is that the traditional way of producing food has turned into a specialization of crop areas, monocrop cultures, that result in poor ecological diversity. Second, major transport operations are necessary to distribute the crops across continents. Thirdly, current agriocultural methods can use more than 80 times the amount of fossil fuels in energy than what it produces in food calories. Most importantly, our agricultural land capital is decreasing, and the world’s population and living standards ever increasing, with a large part already having difficulty securing food. While to some extent world hunger is due to unequal distribution and politics, the pressure on marginal areas is measurably going up. The formula to calculate the surface of a sphere was devised by Archimedes of Syracuse around 150 BC, along with a few other useful things that allowed us to escape a feudal existence and enter the age of what we believe to be developed culture. Since then we can safely say that our planet seems to have a fixed surface area, of which about 70% consists of water and of the 30% that remains only 13% is potential arable land (ref), and of this only roughly half is used as agricultural land. Due to erosion and desertification large areas of arable land have become degraded, up to 75% in central America (ref). While the total area of agricultural land keeps growing (4.5 billion in 1955 to 4.93 billion in 1996 (ref), it does not keep pace with the growing population or its increasing food consumption per capita (24% more than in 1964 (ref)). Already large numbers of people are succumbing to starvation or on the brink of it, and threats to the food supply such as the use of food crops for fuel such as Ethanol seem to suggest these circumstances are expected to worsen rather than alleviate in the near future. In short, decent agricultural land is in short demand while an unstoppable population growth of the world stresses the current supply beyond its capacity. Current estimates for the world population reveal a growth of 40% in just 40 years time (ref), dragging the numbers in an ever increasing downward spiral. It is important to realize that the remaining portion of arable land that is suitable for effective agriculture does not consist of large expanses of green rolling hills just over the horizon. It mostly consists of pockets of land enclosed within steep mountain regions, fragmented in urban and industrial areas and remote natural lands best left undisturbed for obvious preservation reasons. Most agricultural land which can be reasonably used with current technologies is already in use. There are various enterprises being developed to assist in expanding the total food production capacity. The creation of more agricultural land, via new irrigation methods and new food crops that grow in harsher conditions. The increase of the output of existing agricultural lands by new food crops (through genetic engineering), alternate irrigation methods and higher capacity fertilizers. The problem with number 2 is that developments in the market and with concern for environmental issues there is increasing resistance to these methods. The pressure on increasingly engineered agricultural products brings with it dangers that are not insubstantial, and pressure on higher yields for land can lead to further desertification and land exhaustion. Therefore we have attempted to focus on the increase of land, while using the best of developments in increase in yield secondarily. Rather than growing our food in remote areas of the land and spending large amounts of resources in transportation to distribute these, the growing of food within cities itself may provide an additional source of agricultural capital. This has as an added advantage that the consumer and the producer are geographically linked, reducing the distance and thus the transportation costs of the food products, and providing certain sociological benefits to society. Food is usually grown in a remote area, where it is harvested and transported to an equally remote processing plant. From there it is further processed and packaged in perhaps a third plant and is then transported to distribution centers. From there it goes to retail outlets where most people purchase it and and take it home. Growing up in this type of society does not allow new generations to connect with the natural world and its source of nutrition, the cycle of life and energy sources and what the efforts to keep us alive comprise of. It has been recognized on various levels and in various disciplines that this remove from an understanding of the natural world and our food cycle is detrimental to the development of humanity through the lack of a basic understanding and respect for its fundamentals. Urban agriculture could play a large role in reintroducing the knowledge and understanding of these fundamentals into the life of the urban dweller, of whom there are ever more compared to rural dwellers each day. We can imagine urban farming in a variety of scales, starting with a few consumable plants in the window sill to large scale vertical farming industries. It is useful to divide these different types in three scales, since they require different approaches to effectuate. Small scale urban farming is not uncommon in large parts of the world. Typical of the small scale is that the food is produced by the same people that consume it. In many communities people enjoy growing certain herbs or spices in their own domain to guarantee freshness or a flavor they cannot obtain otherwise. 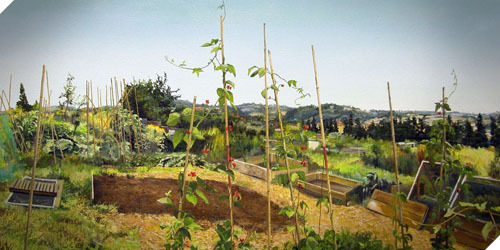 Sometimes a hobby in food gardening can extend itself to the cultivation of an allotment garden, not uncommon in the United Kingdom, Germany and Sweden. These provide important community functions as well as educational and leisure services to a wide range of age groups. However, their food production is limited and inefficient due to a high degree of fragmentation and it can not be expected for a small roof gardens to be a major contribution to actual agricultural land. Its benefits should mainly be sought in its sociological and ecological benefits, such as water collection, waste recycling and educational purposes. This is usually an enterprise organized by a single entity in which members of the community it feeds are employed, either paid or voluntarily, to provide food for this community. They often focus on a certain environmental approach to food production that normal channels do not provide or only at a high premium such as organic and specialty crops. Usually the grounds are in the vicinity of the organization benefiting from them. A good example of medium scale urban farming are university food gardens, providing some or all of the food for a number of residential colleges or dining halls. The gardens are usually run and maintained by the university, with students from the community assisting where members of the community work to grow the food. Medium scale urban farming is a good way to use smaller fragmented areas of urban fabric for food production as well as providing a visually, culturally and socially stimulating space, while aiding biodiversity, urban heat island effects and providing for functionally active open spaces. It is interesting to note that traditional Chinese gardens, admired around the world for their quality and sophistication, were food gardens for the most part. Also Cuba has employed medium scale urban farming to overcome the hardships it faced after the soviet block fell and the economic boycott of the United States put the economy under pressure and increased the prices of oil significantly. Cuba reverted to the use of oxen and manpower for its agricultural needs in favor of tractors and machinery, and converted open areas in and around cities to small farming enterprises, an advantage in relation to the rest of the world, because of its increasing independence from oil. With the rising oil prices, Cuba will be hardly affected and has meanwhile ensured a more sustainable method of operating. Still, medium scale urban farming is difficult to extend to something larger than a local community, and while it usually makes use of land that would otherwise not be used for food production, does not add to farm land capital as a whole in a structural sense. Therefore this article forcusses on large scale urban farming, which will be discussed in the next chapter. Urban farming on a large scale is a different animal than medium and small scale altogether. Relying on a large volume of production it is hard to imagine this being organized by anything other than a single professional entity that employs people on a full time basis to operate its facilities. To achieve a large volume of production in urban areas, and observing the economic forces at play in such an environment, agriculture will need to be stacked to make use of the costly land as efficiently as possible. Depending on the price of land this could be just several stories or as many as those of the tallest skyscraper. This alters the way agriculture is performed in many ways quite radically, and the interaction with such a farm in a city context is also an entirely different experience than traditional farming allows. Current research profiles a possible enterprise to feed up to 50.000 people based on a caloric intake of 2,200 people, a staple built up from the Center for Nutrition Policy and Promotion’s dietary requirements and 19 floors on a 250.000 square foot area, or 43 floors on a 90.000 square foot area (ref). This would include the growing of Tilapia in tanks (the most nutritious fish), and breeding chickens for mainly egg production. Of course the farms could be larger (which might be impractical in an urban setting), and there is no reason to assume a somewhat smaller farm won’t operate less efficiently, given a certain minimum size, which seems to be at around 100-150 m2, in our experience, more or less dictated by local economic conditions. Urban farming requires a different approach to traditional farming, for instance, since one has less access to daylight, artificial light has to be provided. Also, since working with soil is impractical, various soil-less techniques can improve the growing conditions, and by regulating the environment high efficiencies can be reached. Current research is exploring two paths along which to develop methods of vertically stacked farming. One is Hydroponics, using artificial non-consumable substrates on which the plants are anchored through which water flows with added nutrients. Without the involvement of soil, the process becomes cleaner, and the plants grow more efficiently. When a full day and night cycle is employed for growth using artificial light, an efficiency of up to five times compared to traditional agricultural practices might be achieved. Using Aeroponics, in which the roots of plants are suspended in dark boxes in which a vaporized nutrient solution is channeled, the growth efficiency can be even higher. Using the inedible parts of the grown plants as well as the compost influx energy can be generated using methane conversion to power the lights, assisted by Photovoltaics on the roof and built into the windows. 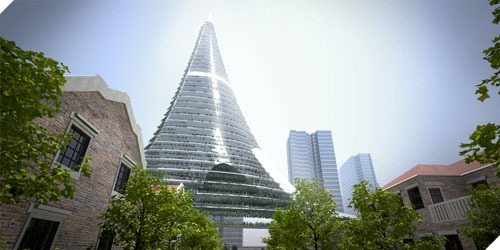 There are various other ways of energy generation technologies that can be applied, as well as several light transmission techniques such as light tubes and tunnels to channel light further into the building than direct sunlight allows. Currently the most promising technique for using the compost is by extracting the methane and then use cogeneration as a conversion technique. By burning the methane electricity is generated as well as heat. The heat is then used for various tasks within the building itself and can provide neighboring buildings with heating and hot water as well. Even though burning would occur, this would be a carbon neutral solution since the carbon was sequestered by the growing plants in the first place in order for it to end up in the methane. Taking all this together and performing a rough but conservative energy balance analysis it has been concluded that it is very likely that a farm can be built that uses little to no energy from exterior sources (ref). Most if not al of these technologies are realities and are in effect in various configurations around the world. They have not yet been combined, and the challenge of building a vertical farm lies in connecting and operating these separate technologies as one efficient system. "1. The urban hydroponics model of Vertical Farming is both presently realizable and profitable. The investment return is comparable to stock market averages. The report is positive about the financial viability of a vertical farming project, but understands and recognizes that a project with normal return on investment characteristics but with a high risk factor will not be easy, and that emphasis should be placed on the secondary benefits of vertical farms such as water filtration functions, reduction of food transportation costs, increase in food quality and laying the foundations for a sustainable urban development. Funding for the first, experimental, vertical farm should be sought in the area of Philanthropic organizations as well as Venture Capital firms, according to the report. However, I believe that in countries with active participating governments such as in Scandinavia, Germany or the Benelux, it should be possible to create an experimental project to serve as a foundation for further investment on a larger level. With countries such as the Netherlands taking pride in environmental technological achievements (e.g. Delta Works), and having agricultural innovations in greenhouse technology as a major export product, it would suit their international agendas by being the first to develop the technology and expertise to build and run these operations. Once the experimental nature of vertical farms has been explored and the knowledge has been gathered to implement these effectively, they could be used to effect an even more substantial gain by providing developing countries with the ability to build and maintain these operations. An example for this can be sought in existing algae plants. Highly profitable Spirulina Algae plants have been built in Africa to aid small towns in both generating nutrition and economical resources. The "Central Food Technology Institute has been active since 1960 (ref) in implementing algae growing plants in India quite successfully, and the African Green Future initiative in cooperation with IIMSAM (Intergovernmental Institution for the use of Micro-algae Spirulina against Malnutrition) uses algae plants built by hand out of mud and some bricks to treat large quantities of raw sewage and turn it into animal feed, fertilizers and biofuel (ref) . It should be noted that algae plants are of a technological very different nature from vertical farms, and the latter usually requires a higher standard of maintenance, operation and investment. Also, Spirulina plants are highly profitable and require little investment. Their development profile is quite substantially different from a vertical farm. That said, their usefulness is limited, one can only do so much with algae. While it can be used for human consumption (it is also one of the few non-animal sources of vitamin B12), it really is not diverse enough to become a staple of nutrition for a nation. Once success has been achieved with simpler methods such as algae farms, low-technology vertical farming techniques could be experimented with to aid in the increase of agricultural capital and crop diversity. Imagining a future where urban vertical farming becomes an important driver of the food production industry, the consequences on a social and political level would be difficult to predict, but they would be substantial. Major shifts in food distribution networks would ensue and therefore changes in political trade balances between nations and regions. Urban farms would compete and most likely gain the upper hand in the production of the majority of food in urban regions, leaving agricultural land to be used for more specialized uses, or to be returned to a natural state. Of course the production of food crops on land will quite likely remain financially beneficial as its primary investments are low, but as oil and energy prices rise, the transportation of these crops will gain an increasing share in the cost of traditionally cultivated food. On a sociological level people in dense urban environments would be partially reconnected with the cycle of resources that exists in the natural world. Waste would be locally treated and used to grow nutrients that are then consumed locally. 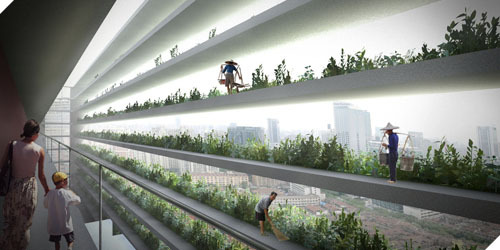 The requirements of the vertical farms in terms of labor and maintenance would mingle a modern agrarian work force with that of more typical urban dwellers, which might prove for an interesting cultural interchange. It might serve to re-establish a certain respect and understanding for natural processes in the educational system as farms and schools can be co-located, and other functions be integrated as well. It would not be a large stretch of the imagination to envision the merger of public places and food production, after all if Chinese gardens did it in ways we admire now, why not apply it to a new urban development? For developing worlds the farms could be a center for development, and substituting some high technology solutions with labor intensive solutions provide for employment for a substantial number of people. For developing areas it would mean a more reliable source of food, a more solid infrastructural foundation to build a society upon and a basis for a more solid economy. In addition it would likely reduce the amount of food related traffic within the city, although that is difficult to quantify. The quality of food could be regulated better and the water filtration properties of a vertical farm are paramount to healthy future development, this being a major issue in many developing areas. It could assist in providing employment for women in countries where women have lower (agricultural) social status and provide for a framework of reintegration of these classes and an emancipation of this status. 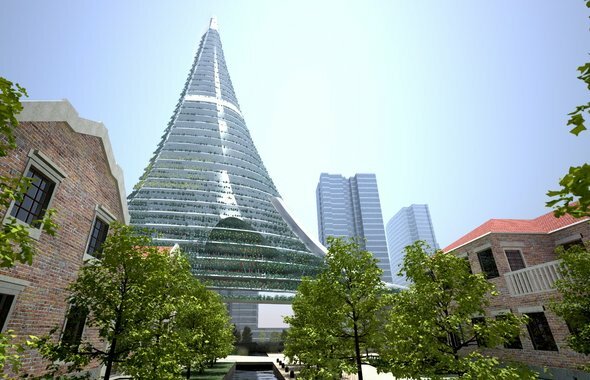 But not just for developing countries vertical farms could be a solution to multiple problems. Countries like Iceland, Chili and Japan, which have very little agricultural land available, could start reducing their dependence on imported goods, reducing their vulnerability to market fluctuations. Large scale urban farming, in the shape of vertical farms, can thoroughly affect the way we provide for our daily necessities. Its potential is enormous, positively affecting transportation, food quality, the economy of cities, and the sociological landscape of urban areas. However, it depends on its level of implementation how influential it can be. The impact of urban agriculture, vertical or not, could range from large to small. The range spans from a nice and functional addition to the agricultural services providing some places with a percentage of their food contribution in highly developed countries, to revolutionary development in food production that shifts the balance from rural to urban and empowers developing countries in economical, political and social ways as not seen before. Until then it is necessary to continue to push for experimentation and exploration of this realm. The technologies are known, but they've hardly been used in such a way before. Also, the economical characteristics are not entirely known. Without test sites and further research into the implementation of vertical farms into the fabric of the city it will remain guess work. What is certain is that vertical farms provide an enormous potential for changing the functional operations of cities the world over, and that whoever manages to harness them in an economically and ecologically sound way has a bright future ahead of them. International cooperation to achieve the first few plants would be a good start, and a number of experimental vertical farms the next step. No matter how it will bedone, large scale urban farming is a viable opportunity that can play a very important role in the next century, if executed correctly.